All of the POWERED STAIR CLIMBERS that we supply operate via a removable rechargeable battery and have been designed with some of the loads you move in mind. The POWERED STAIR CLIMBERS are split in to 3 different model groups offering different capacities and features as you move up the range. The SAL comes in 4 handle types and 3 lifting capacity capacities (110/140/170) to offer support on a wide range of load carrying problems. You can full this range HERE. The MTK comes in two models, 190/310 kg lifting capacities, the 310 comes with automatic brakes as standard and the 190 can have these fitted as an optional extra. You can view this range HERE. The HD comes with electronic automatic step edge brakes, puncture proof tyre as standard and with a lifting capacity up to 330kg make heavy loads easy to move. 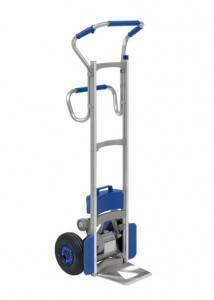 The HD also boasts a Dolly Wheels option providing easy movement between step locations. You can view this range HERE. Buy direct or talk to us on 0800 458 8025 for more information!